There’s this persistent myth that I need to tear down once and for all. Maybe it won’t all happen in this one blog post, but by God I’m gonna give it a good start. The myth? It’s that all it takes to succeed is hard work. I have seen lives destroyed by that myth, more than once. For example: I’ve had a few conversations with a smart scientist who works for a hard-driving, work-all-the-time boss at a major university. This hard-driving boss is in the lab all the time. Nights. Weekends. Days. No social life. Health problems. Unhappy employees. In the past few years, this hard-driving boss has had trouble getting grant funding to keep her lab running. Her response? Everyone must work harder. Has that solved the problem with funding? No. It’s only tanked morale further. It’s gotten the boss more stressed than ever. The boss has made increasingly poor decisions. Her health has degenerated. She’s having family problems. Are the most successful people the hardest-working people? Around me, some of the hardest-working people are the ones who do construction work. They work 10-12 hours per day, often in very poor weather conditions – 110 F in summers or below freezing in winters. I am not here to diminish the value of that kind of work. It is essential and I am thankful that there are people doing it!!! That said, does this lead, ever, to the kind of wild success represented by, say, a Nobel prize, or being a New York Times bestselling author, or making a million dollars, or discovering a genuine cure for cancer? They’re two very different kinds of work. One is physical labor where inputs=outputs. It’s a linear relationship. The other is creative, mental work where inputs ≠ outputs. They are only very loosely correlated. In that creative work, you have to work hard, at times. But chronic overwork gets you nowhere special (and is, in fact, counter-productive). Creative/mental work is defined by the quality of ideas, not the quantity. A few Nobel-quality ideas, well-executed, will outweigh 1000 mediocre ideas, any day of the week. 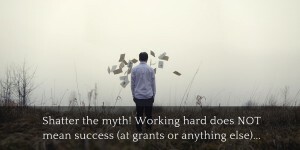 Working hard when required – the ability to work really hard and effectively in bursts when it’s required to finish a project, such as a grant proposal in the last few weeks before submission. Relaxing and recuperating – When hard work is not required, we need to let our body and mind re-build its capacity. This is the most difficult of these pointers for most people to implement. We are chronically in overwork mode, and most of us have seen everyone around us working all the time, so we think that’s what we must do, too. To do anything else means we are “slackers.” You have to abandon that notion that to recuperate is to slack. They are not the same. Slacking is a chronic condition of not doing stuff. Recuperating means to take time off on a regular basis, balancing out your periods of hard work. Think about someone who’s truly successful. Do you have the notion that “they worked really really hard to get there?” There are examples of people who worked really, really hard to get their wild success. But for every example of a hard working Nobel laureate, famous musician, or famous novelist that you might come up with, I can come up with an example of someone who achieved similar fame, success, or fortune who didn’t work nearly so hard at it. A fallback position might be “they just got lucky.” Well, sure – if you like to attribute all success to luck, then you give away all your control and power to affect your destiny. You’re basically saying that it’s all a roll of the dice. If it’s a roll of the dice, you might as well not work too hard, and instead, start buying lottery tickets. There are “lucky things” that happen to successful people. But they usually ended up with that “luck” because they biased the odds in their favor, by being around the right people, in the right places, with the right kind of ideas. You do that enough times, and you are way more likely to “get lucky” than if you are simply “working hard” OR buying lottery tickets. People have silly notions of “what it takes to succeed” – and neither hard work alone, nor “getting lucky” is sufficient to explain success. Understand that there’s a science to it. There is a science of when to work hard, when to relax, and how to bias the odds in your favor.